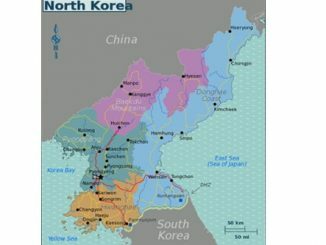 The following article by Jude Woodward, about the crisis the US has whipped up about North Korea, was originally published by New Cold War.org. Trump’s dramatic escalation of sabre-rattling over North Korea from mid-April was not triggered by any new provocative action by North Korea nor any notable advance in its nuclear or missile programme, although in the din of overwrought rhetoric emanating from Mar-a-lago it appeared that the US and North Korea’s neighbours faced an imminent threat. But this crisis was conveniently timed to influence the outcome of the South Korean presidential elections due on 9th May. The bellicose response by the US and others to the latest developments in North Korea is in no way a proportional response to any real threat from the small East Asian state, but an excuse for quite other military objectives. The US used its known language of war – ‘a real and clear danger’ – to announce its decision to extend its advanced missile defence system to the Pacific island of Guam. As no one in their right mind believes that North Korea has the capacity to hit the US – or virtually anywhere very far from its own borders – with a nuclear-armed missile, this step has other purposes. 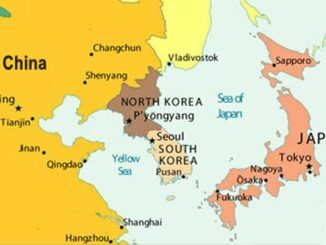 The country in the US’s binoculars is not North Korea but rising China, and the Guam move is a further step in its announced ‘pivot’ to Asia aimed at militarily encircling China.